Nethra Samarawickrama is most interested in the people whom history has neglected. Visitors to the UN World Heritage Site of Galle Fort find that the presence of the Portuguese, the Dutch and the British is well documented. Inside the Fort’s upscale boutique hotels, colonial artefacts are lovingly preserved, colonial architecture painstakingly restored and tales of three colonial powers recounted with nostalgia. Outside the hotels, some streets are lined with houses that have become the holiday homes of visiting Europeans – they stand empty for most of the year. But what of the local communities within the Fort itself? The Dutch Burghers with their colourful language and exquisite cuisine? The young Muslim women who live behind latticed screens? What of the local lace makers, builders and craftsmen, asks Nethra, where are the museums devoted to them? Nethra says it was her need to find a telling of the Fort’s history, which didn’t gloss over a critique of colonialism that partly fuelled her research. In her paper ‘Dowries, Dupattas and Doorsteps: Insiders and Outsiders of the Fort of Galle’, she explores how within the ramparts of a post-colonial fort, local communities have claimed their own spaces, written their own histories. Fresh from a Bachelor’s degree in Politics from Ithaca College, USA, the 26-year-old found she was curious about the story of the Fort’s indigenisation. Among the diverse communities that call the Fort home, are families that have resided there for generations. In her capacity as an independent researcher for the International Centre for Ethnic Studies (ICES), Nethra lived with one such family with a home on Lighthouse Street, and over the course of several months conducted many interviews with the Fort’s residents. Nethra would begin with “Tell me about your life story”. For this paper, she allowed her interest in gender and spaces to prompt her to look at the story through the lens of three generations of resident Muslim women. Freely acknowledging the diversity of the Fort’s inhabitants, Nethra says, “There are very specific reasons I chose to work with Muslim women, and that has to do with my own academic interests…rather than with the total history of the fort.” An ethnography, the paper is a field study which places the author on intimate terms with her subjects – Nethra shares stories from the women’s kella kale (girl-child time), lamissi kale (young girl time), and bandapu kale (married time) and does so with humour and warmth. The paper boasts little in the way of quantitative data and though Nethra intends to cast the net of her research further afield in years to come, her focus this time remains on the oral narratives of people who are still alive to tell the tale. Nethra has not yet done any research that dates back to the colonial occupation. She says she wanted to go in without any preconceptions – “part of my methodology was to let the fieldwork tell me what to study…for now I wanted to see how people remember and see how people narrate”. The Galle Fort that Nethra discovered was one in which the kissing couples had replaced cannons in the embrasures and where children claimed the ramparts for games of cricket. Simultaneously, the Fort’s old symbols of power, its colonial insignias and administrative buildings were in disrepair. In her introduction, Nethra observes: “In the neighbourhoods and houses of the Fort, people lived and worked; local life that had once been kept out was now thriving, reinscribing its spaces with their own meanings, which were dissonant as well as resonant with colonial conceptualizations of the walled city.” She goes on to describe how these local communities thrived and existed on terms of great intimacy, until the influx of European expatriates. In the early 2000s, when the government chose to temporarily lift the 100% tax that prevented foreigners from purchasing property in Sri Lanka, the Fort had quickly become prime real estate. After the tsunami, a number of NGOs established offices in the Fort and the city drew ever greater numbers of tourists and investors thanks to an aggressive marketing campaign. “As international capital poured into the Fort and the real-estate value of the houses escalated, local residents began to sell their homes and move out of the walled city. Within a five-year span, almost one fifth of the Fort’s local families had left and European residents or investors had taken their place,” notes Nethra. “There are more and more signs of an elite white presence that seems to me more intense because of the history of the place.” What did this mean to the locals? On one hand, it means their homes are appropriated for hotels and designer stores, even as their way of life changed. On the other hand, it meant the Fort’s residents now could profit from the global tourist industry and the international real estate market. But locals also had other reasons for leaving. Within the Fort’s families, property was often exchanged as dowry. However, many modern couples found that since Colombo served as their professional base, the cost of maintaining two homes was simply too much. 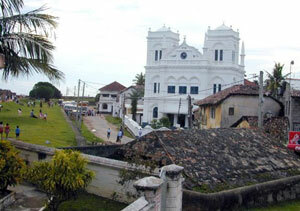 “To live in Galle or to leave Galle is a decision many have had to make,” says Nethra. For those who chose to stay, the dress code for women within this largely conservative society is another subject of heated discussion. The last, the matter of doorsteps and the houses to which they are attached, is perhaps the most sensitive of them all. “The biggest and most intensely felt debate is about the Archaeological Department’s activities in regulating and monitoring buildings in the Fort,” says Nethra explaining that such old buildings are often impractical to live in. The department’s objectivity is also frequently called into question by locals who make allegations of favouritism toward foreign house owners. The community’s sense of security is further threatened by all the new arrivals. Older residents say that many watchful eyes used to follow the movements of any outsiders, a thankless task when strangers arrive by the hundreds in tour buses. Still, it’s some compensation that each camera wielding visitor represents a possible source of revenue. It’s no surprise, then that the Fort’s inhabitants have a love/hate relationship with tourism. Last February, she chose to spend the four days of the Galle Literary Festival with her friends in the Fort, and reports that they seemed to experience a combination of pride in the Fort and a sense of exclusion from the events. Though many would clean their homes for guests, almost none would attend anything aside from the free shows. Once again, it’s a complicated situation and only one thing is certain, the Fort’s residents will continue to adapt as best they can. Within the week, Nethra will be leaving to pursue a Master’s Degree in Anthropology. She hopes to return to continue her research and is determined to build a record of the Fort’s vanishing communities. Tags: Colonialism in Sri Lanka, Galle, Galle Literary Festival, Nethra Samarawickrama. Bookmark the permalink.